When you photograph at night, your camera's meter isn't reliable to give a correct exposure. 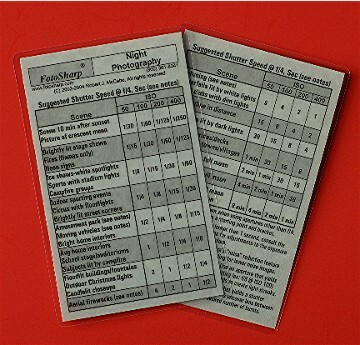 This 3.5" x 5.5" laminated cheat sheet provides a handy solution, with exposures for numerous popular nighttime scenes - both indoor and outdoor. This card is an abbreviated version of our Day and Night Exposure Guide covering scenes at night. Covers film speed/ISO settings from 50-400.